For Mother’s Day this year, we plan on spending the entire day with our kiddos. We also plan on taking relaxing afternoon naps while our husbands change the kiddos dirty diapers. And fold the laundry. And wash dishes. And sweep the house. Not going to hold my breath on any of that. However we can count on filling our tummies with this delicious fresh-baked-out-of-the-oven breakfast!! Talk about yummy! 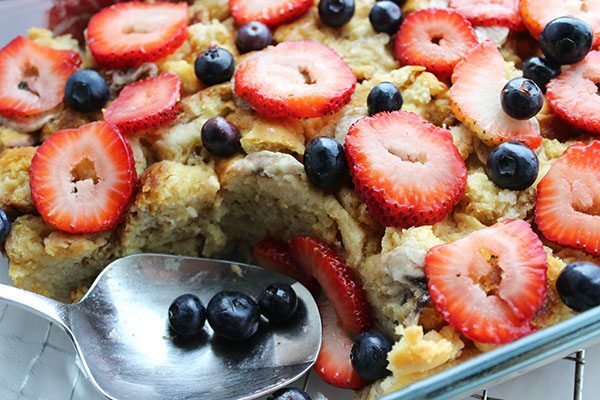 This Berry Simple French Toast Bake is so uncomplicated that even the manliest of men (of course I am talking about my hubby here!) can whip up it up like a champ. It only takes about 7 minutes and minimal ingredients to prepare. So even if you end up having to make breakfast for yourself, you will still have the entire rest of the day to hang out with your kiddo(s). And of course take a relaxing nap. Bake biscuits according to package directions. While biscuits are baking, prepare a 9x13 baking dish with non-stick spray. Tear biscuits into bite-sized pieces and arrange evenly in prepared baking dish. Blend coconut milk, almond milk, eggs, vanilla and cinnamon in a high speed blender for about 30 seconds or until combined. Pour blended mixture evenly over the biscuits. Cover with foil and bake (350F) for 35-40 minutes or until the casserole is firm and slightly crispy on the edges. Carefully remove from oven and let cool for a few minutes before topping with your toppings of choice! How many oz. of coconut milk? Looks yummy! 14 oz can (updated the recipe) thanks for noticing! 🙂 Hope you enjoy it!